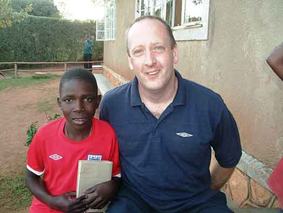 A funeral director from East Anglia has spent his holiday working in a Ugandan orphanage. Andrew Fairweather, who works at Rackham’s Funeral Services in Diss, spent two weeks at the Namugongo home, which was set up by his friend Kevin Hammond. Kevin is chief executive of charity The Cogwheel Trust International, which provides homes for vulnerable children in India and Uganda. The building, which is home to 99 children, needed some repairs and redecoration and Andrew, as one of a group of 10 people from churches in Suffolk, went out to help with the work. Between them, in two weeks, the group managed to redecorate all the bedrooms, re-gutter the whole lower level of the house, mend a hole in a drainage pit, fit a pump and new tank for the water and place concrete around half the house to channel away rainwater. The charity also runs a children’s centre in Mpoma, which helps struggling families, by providing children with morning and evening meals, as well as a bath. Many of the children live with their grandparents and the centre helps to relieve the pressure on them. Andrew and his team concreted a bathing area there. The highlight of Andrew’s trip was meeting the boy he has been sponsoring for some time. Brian Kirunda, who lives at the orphanage, has been sponsored by Andrew and his family for the last five years and this was their first opportunity to meet up.